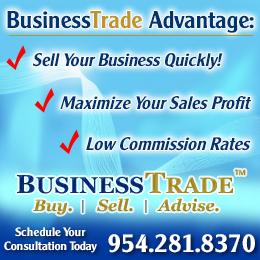 BusinessTrade is a premier Florida business brokerage providing specialized intermediaries services for those seeking to buy or sell a business. Our experienced brokers will help evaluate, market, and sell your business in a timely and confidential manner. We will professionally market and network within the business community to seek out well-qualified buyer/investors for your business. for your business. network with potential buyers and thoroughly vet all interested parties marketing skills to utilize our network of potential investors/buyers and conduct personal screenings of all interested parties, while utilizing our network of potential investors to maximize interest in your business. We always work diligently with you to maximize potential business value and complete your business transactional events in the most timely manner possible. Whether you are a seasoned investor, seeking an acquisition that would provide some synergy to your existing company; or an individual buyer who has specific criteria for that perfect business to purchase, our representation services can save you time, money and frustration. By understanding your personalize acquisition criteria, we can find the perfect opportunity that fits your specific needs.